TEARS flowed yesterday as the family of slain Eston farmer Mick Hampson (69) and a large contingent of farmers and supporters hugged each after his killer was jailed for life plus 15 years’ imprisonment. Sentencing Siboniso Mtolo (28), Pietermaritzburg High Court Judge Isaac Madondo said that farmers provide essential services to the nation and need protection, because without food production, people can’t live. The judge said if criminals like Mtolo were not adequately punished, the situation would continue indefinitely. 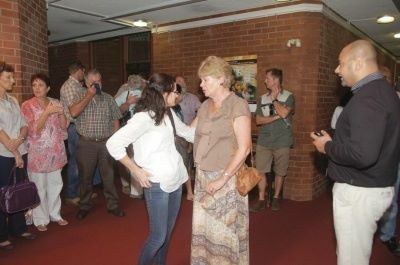 Hampson’s distraught widow Anne, sons Garry, Rob and Murray, and the latter’s wife Lee-Ann, were overcome with emotion as a large crowd of supporters gathered around to hug and offer them comfort after the sentencing. Despite welcoming the sentences, Anne Hampson said she was aware that her late husband would not be there to greet her when she got home. “I don’t think the sentence changes very much for us. We are glad though that he (Mtolo) was sentenced to life imprisonment and that he is off the streets and can’t hurt anyone else,” she said. Murray Hampson, who had a narrow escape after being overpowered by Mtolo and robbed of his father’s shotgun — which was thereafter used to shoot the farmer — expressed the family’s gratitude to the community, the police and justice officials. “We have met some really amazing people on this journey and it gives us hope to know that there are people like this out there in the justice system,” he said. He made particular reference to Shaheen Suleiman and his team from Magma Security, and the police whose hard work led to the arrest of the suspects within a month, state advocate Candy Kander and court preparation officer Roelien Wiesner, whose support had been invaluable, he said. The court heard that the Hampson family has been severely traumatised. Judge Madondo referred to Anne Hampson’s pain and mental anguish which keeps her from sleeping, and the fact that the family had viewed Hampson as a “pillar of constant support and strength”. “He (Hampson) was also very helpful to people less fortunate than himself. His death sent shockwaves throughout the whole community,” the judge said. Passing sentence on Mtolo, Judge Madondo said other would-be offenders must “learn a lesson” that these types of offences won’t be tolerated and to think twice before committing crimes of this nature. He could find no circumstances in Mtolo’s favour which justified lesser sentences. Judge Madondo said he didn’t believe Mtolo’s expression of remorse was genuine. Instead he felt “regret” because he realised he was going to spend most of the remainder of his life in jail. He said Hampson was an elderly farmer who’d suffered a knee injury, as a result of which he had difficulty walking and used a walking stick. “He was gunned down in cold blood at close range… The accused (Mtolo) knew him very well but he created an impression that he did not know that he walked with stick,” he said. The judge said a post mortem report revealed that the shotgun was a mere centimetre from Hampson’s chest when it was fired. “At the time the deceased (Hampson) did not pose a threat to the accused. He shot him in order to make good his escape,” the judge said.